It is the beginning of April. A lovely time of year here in Cambridge, Massachusetts, where I am writing you. The sun is brilliant; leaves are bursting out all over. It is going to be 82 degrees out today; it was just 30 last week. These rapid fire changes are, of course, the norm in New England. Temperatures may drop sharply yet again, but the odds are we are now on the necessary path to deliver spring for sure. I ought to be outside. I’m 70 now, you know, and I’m supposed to be retired. Instead I found that word almost ludicrous in the extreme. There is no rest for the weary. One reason why is the stack of auction catalogs which I cannot quite reach by leaning backwards in my desk chair. Every day now, the best that major auction companies (and some small ones too) can offer is just about a finger’s length away. They taunt, they point, they arrange themselves in a seductive pattern on the floor, they teeter in makeshift towers which are anything but stable, and fall frequently, giving me yet another look at the bounty inside… bounty that I want. I thought I’d write this article for you, to show you what you must do if you plan on becoming a major collector, or even an episodic superficial one. There are steps you must take. There are actions and procedures you must learn. As always, you must restrain yourself; it’s part of what being a connoisseur is all about. Focus on the best. Never be or remain satisfied with anything other than quality. For many years now, I have regarded April, when the first major auctions take place, as the true beginning of auction season. The auction schedule is clogged for this month, May, and June. The loveliest things in the world go on the block during this period, and must sell now before the summer descends, when the unrelenting heat crushes our desire to sit inside and make learned remarks about things we probably cannot afford. The first thing you need to know about auctions in this season or any other, is that homework is required. Collections are built through assiduous effort, constant viewing and reviewing of objects and offers, constant communication with your stable of experts, and frequent attaboys to keep your spirits up and, as they said in the Revolutionary War, to keep your powder dry. Upon receipt, review your catalogs at once. True connoisseurs, that is to say people who play the game better than anyone else, want information early, thorough, and precise. Thus, when a new catalog arrives (that could well be every single day), you must sit down and glance and skim every page. When you get good at this game, this review will only take 10 minutes or so. As you skim, mark each page that contains something of potential interest. The best thing to do is when you have a little bit more time, create bookmarks by cutting up scrap paper and keep a jar full of them so you’re prepared when the catalogs arrive. This preliminary review gives you a sense of what may become important over the next days and weeks before the auctions. The goal is not to make a decision now, it is simply to give you a bird’s eye view of everything that is coming up at the auction houses you follow. Thanks to contemporary universal communications, you may have auctions you’re interested in in Stockholm, Vienna, Paris, London, Rome, Amsterdam, New York, and other major cities, whereas in the olden days, before the internet and computers, you probably couldn’t follow more than one auction house in one city at a time. These days it is perfectly common to follow both major auction houses (Sotheby’s, Christie’s, Dorotheum), and some localized regional houses. Let’s be honest with each other: this is not easy to do. It takes sustained focus, and a willingness to do what is necessary so that you will not be intimidated when you look for goods in Sweden or Madrid. The worldwide communications revolution has quite clearly fundamentally altered communications, and they have made it possible to learn about, study, and acquire the lots of your highest interest. Craziness extra. Once you have accomplished your preliminary review, consult your bank book. As I so well know, being a connoisseur with a desire to achieve a splendid collection of international importance selected from the widest variety of goods, you must follow up your preliminary review with a more thorough secondary review. It is a wise idea to organize this review by date. Remember, when you’re dealing with many auction houses worldwide, your life will be like a popcorn machine, with new sales popping up all the time. Thus, organize your catalogs in chronological order. Don’t just mark the objects you’re interested in, mark the objects you need help with. I can recall one instance, for example, when I was purchasing Swedish silver sugar bowls from the 18th Century and before. Some of the best silver of this kind was produced in Stockholm, which was then a major political force in Europe. The silver bowls produced in Sweden, however, did not feature elaborate family coats of arms, or other heraldic markings. I was curious, because the objects would have been so much more dramatic, at least in my opinion, with these engraved devices. But it was not the custom to engrave silver as they did in every other major European power. Chacun à son goût. So… review all your catalogs… mark the items you are interested in… and be clear on the sales date for each catalog you’re interested in. Here is where strategy comes into play. You may see, as I often do, a lovely item on page 1, that is not quite as lovely as an item on page 6, that is not quite as lovely as an item on page 52. Connoisseurs have a constant dilemma. Should you nail down the first item in an auction, even though that may constitute all your available resources, or should you pass on the first item to get to the second, doing the exact same thing to get to the third item. This is a conundrum, a puzzle, an ongoing test of your strategic abilities. Very few of us have unlimited resources. We must, like I have done throughout the years, work harder, research more thoroughly, and enter the auction arena with nerves of steel. In the auction game, things change with lightning speed. Items which you think you couldn’t afford all of a sudden are selling for fifty percent of what you thought they would. You have to be ready to make the appropriate move, and you must never regret it if your strategy doesn’t work out. Learn from your failures. By the same token, when you get something that you didn’t expect to get, and you get it below the low estimate, do a happy dance around your desk and whoop it up. Napoleon Bonaparte used to say “Give me the lucky man.” The more you play this game, the luckier you will get. This brings me to the spring silver sales now underway. I have been spending the last few days in my usual state of anguish and anxiety. All three major European auction houses are having silver sales of the exact things that I crave and cherish. Two of the companies have their silver sales on the same day… different companies, even different continents… same day. This has happened to me on other occasions, where I have one company on hold on one phone and one company on hold on the other. Complete control and clarity are essential in this situation. Mark the lots that you most want. Do this in all the sales catalogs you have. Do not give way to over-enthusiasm, to an “I must have” attitude. No matter how rare the item you want, there will always be a rarer item coming down the pike. When I was a graduate student at Harvard, I lived like most graduate students. That is to say, I was a man of empty pockets and unyielding dreams. If some wise acre had told me forty years ago that I would be playing this game with some of the biggest international players, I would not just have disbelieved, I would have scoffed. Such things may happen in fairy tales, but not to graduate students without a schilling in their pocket. But my dream indeed has come true. Just this morning, I purchased an early 19th Century Venetian seascape by Giacomo Guardi (1764-1835). It is a lovely picture hitherto down on its luck, needing TLC and lots of it. Luckily, it found me, and it now has a chance of life again, and grandeur. This afternoon I’ve been working on my silver collection. Each of these numerous items is an asset. As I have said for so many years, all assets in play. Do not just sit on an asset and look at its thrilling aspects. See it not just as a stationary thing, but as an asset to leverage more. To be a connoisseur is to be not just a finder of beauteous objects, but an economic wizard, seizing a thing, twisting and turning that thing, until you have another thing, and the process takes place all over again for the rest of your life. I’ve turned to my friend Grace Jones for a comment or two on this matter. Grace is never less than totally frank, which makes so many people squirm, knowing that they may be the next one in her sights. Of Cambridge, Harvard and the ghosts of the many diversified people who lived there. They were experts in theology, education, trade, capitalism, literature, music… all these arts grew here in Cambridge, and at Harvard, often first, since we have always been years, if not decades ahead of the people elsewhere who foolishly make comparisons they cannot hope to win. Folks come to visit me here in Cambridge, my place of choice. Me and all our artifacts, theories, stratagems, plans, great deeds, dreamt of then consummated… it all happens here in my neighborhood and has been happening here for hundreds of years, no end in sight. Those persons urging me to escape while the getting’s good have never of course lived in any place of such scope, brilliance, challenge, and ultimately veritas, truth. Whatever the inconveniences (and they are not rare), these pale into insignificance by a single glance. What I see before me on days no matter what the weather, are the great people, the great ideas, the great dreams, the great challenges, the hope and spirit of a great people, everyone my neighbor. for many years, I have been writing about my neighbors, my instructors, my friends, my lovers, my guests and visitors, and all the richness that they bring with them. I have lived here. I have grown older here. I have used the talents of people I encountered here to build enterprises of international use and merit. And in due course, I shall be buried here. Now I invite you to amble through the following pages. I have selected a fraction of the articles I’ve written about this grand old city… what has made her… what has sustained here… what has made us proud… and the things we are still doing that will in due course make us proud again. 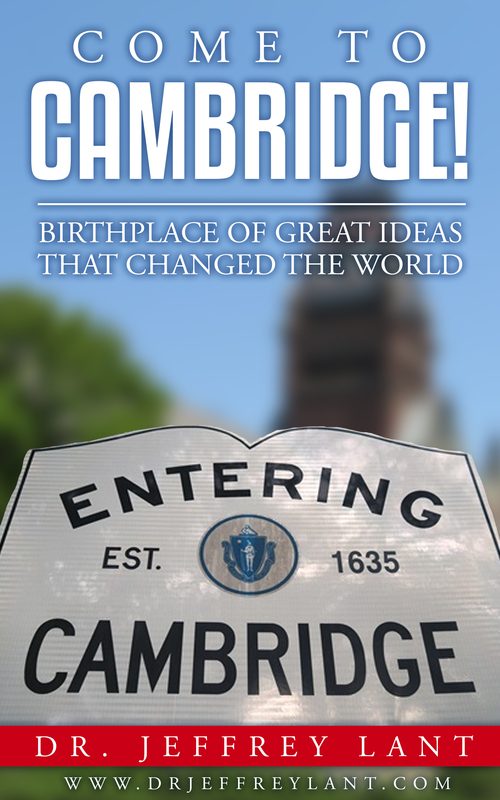 You will see Cambridge people of note in this book. You will learn of history that has shaped our lives and mental landscapes. I tell you about Anne Hutchinson, who despite every obstacle, brought us religious diversity and freedom of thought. I’ve taken you to the homes of notable Cambridge people: Henry Wadsworth Longfellow, Dr. Charles Follen, and George and Martha Washington, to name but a few. I’ve showed you how they lived at various times, and their Cambridge connections. They were just a part of the rich legacy. Read this book carefully; do not skim it. You see, someday if you are very lucky, you may live in Cambridge too. If you do, you will be supremely happy, just as I have been for so many years. Digital copy in PDF and Kindle epub format. “MY SALAD DAYS”… A SILVER BOWL, TIFFANY & CO., CIRCA 1940. IMPORTANT AMERICANA ADDED TO THE LANT COLLECTION. I was in London on one of my many formative voyages, sitting in the balcony mesmerized by The Royal Shakespeare Company’s rendition of Shakespeare’s play “Anthony and Cleopatra” (1623). There was a chatty little fellow sitting right in front of me who couldn’t have been any older than 12, and his mother was on a marathon shushing expedition, trying to get her annoying darling boy to hush. Without dropping a beat, the kiddo asked his mother in a stage whisper, “Does this mean she was Caesar’s salad?” And of course, not only did the audience lose it, but the cast lost it too, and for a moment we gave way to hearty laughter… no doubt the young man was happy with his results. It certainly left a happy impression on me, for this incident took place over 40 years ago and is as clear to me today as the evening I too joined in the infectious mirth. Only in England. My mother was not a notable cook; quite the opposite. But she knew the importance of green leafy vegetables, and a host of other healthy ingredients from which she created salads that were hearty and nutritious… and which she hoped would obliterate the memory of her main courses, which were entirely forgettable, and quite possibly dangerous. I can see the salad bowl now. It was used every night, and only rarely at mid-day. It was wood, and came with a pair of wooden tongs. It followed us on our peregrinations from Illinois to California, and over the years to many other places. There are few serving dishes which have the impact that these did. That is why, when I became aware of this important American silver salad bowl, I gave it a good long look, which included returning to this item many times. I found it on the internet, on the 1stdibs website, which is a cornucopia of interesting things. Once such a sight catches my eye, I feel constitutionally obligated to read all the entries. 1stdibs is so large, that laudable activity is impossible. There is just too much to look at and take in. Thus emboldened, I crept back to look at “my” salad bowl, as I already thought it. It was lovely. Designed by Olaf Wilford, from Tiffany & Co. New York circa 1940, it had the strong bold design of a master. This was no mere salad bowl; it was like all good art a statement by an accomplished master about his vision for the object in question. A designer like Wilford (1894-1980) aims to seize your brain by showing you how even a common object can be turned into art, and seize your eye. Curiously, the bowl was not designed first, as one logically might suppose. No, the first objects to be designed were actually the pair of parcel-gilt silver salad servers, serving spoon and fork. They were designed in 1937 as part of a limited edition. These were followed in 1940 by the silver salad bowl. This striking object, in the Art Deco fashion, was featured in Tiffany’s display at the House of Jewels Pavilion at the New York World’s Fair, 1939-40. Although these items were not created to be a set, they look so good together they soon became one de facto. The bowl itself, with its tomato or pumpkin vine design (not oranges, as was mistakenly written in the original description of the item), was well liked. Thus, Tiffany decided to make a limited number of bowls and serving instruments, and did so until the early 1950’s. Thus right from the start this was a popular pattern, and it was illustrated in Jewel Stern’s “Modernism in American Silver” p. 177 fig. 8.15 and 8.16. A closer look at the bowl and serving instruments. The plain hemispherical bowl applied with five vertical panels, stylized tomatoes and foliage, with a conforming salad serving fork and spoon, chased on the reverse, with foliage marked on base of bowl and numbered 22888, servers marked on reverse all with star mark. Here are its dimensions: diameter 9 ½ in, 24 cm; 15 oz 4 dwt, 095g. These three objects had the undeniable “Wow Factor”, which is hardly surprising since they were designed by a master and offered to the public by Tiffany & Co., a brand name we are all familiar with. A few words about Tiffany & Co.
Tiffany was founded September 18th, 1837 by Charles Lewis Tiffany and John B. Young. The reason Tiffany has been so successful over time is the quality, originality, bold display, and cunning designs which cause you literally to stop and stare the way Audrey Hepburn did in “Breakfast at Tiffany’s” (1961). Even if you’re broke like Holly Golightly, Hepburn’s character, just standing in the window can transport you to a place you want to be, and with the money you’ll need to achieve your goal. Tiffany is all about dreams, social success, and one-upsmanship. Anyone who looks at a diamond or any of the high grade Tiffany products cannot fail to be excited by them. Tiffany supplies the goods, and your imagination – and deep pockets – does the rest. From time to time, Tiffany has deviated from its core principles, and paid the price. It is easy to see how low grade executives in Tiffany’s board room might argue strenuously about the common sense of expanding the gold Tiffany’s name to sell lesser merchandise. However, time after time, Tiffany’s has discovered that it isn’t just the name that’s so important, it’s what that name offers, and stands for. In this connection, I read with the greatest interest and awe of some of the projects that Tiffany’s has been involved with over the years. I can mention only a few of a very great number. For example, Tiffany & Co. was the first U.S. firm to win an award for excellence in silverware at the Exposition Universelle in Paris in 1867. Tiffany designed the logo for the New York Yankees in 1909. In 1887, Tiffany bought the French Crown Jewels. In 1942 Tiffany created a new design for the Congressional Medal of Honor. In 1968, First Lady Ladybird Johnson commissioned Tiffany’s to make a new set of White House china on the theme of American wildflowers, her particular interest. If the subject is quality, Tiffany & Co. is the answer. As part of the 1919 “Ziegfeld Follies”, there was a famous tune by Irving Berlin, “A Pretty Girl is Like a Melody”. It describes the tormented process every collector goes through when they see something they want and must have despite all logical reasons, like: not now, you don’t have any money, you don’t need it, another one will be coming along in a minute. All such concerns are rendered meaningless when the connoisseur connects with the object of his affections, and cannot think of anything else. I have personally experienced this fateful and inconvenient summons, which overturns all of my good intentions for frugality, for saving, for going slow, for being patient, and for never going beyond your capacity. But you know as well as I do that it is the experience of going beyond, of taking the risk, of seizing the object (or the person) and making it yours, totally, unquestionably yours, that thrills you. Connoisseurs can never be attracted to the pedestrian. We crave the different, the unusual, the unique, and we go through much suffering to ensure we get them. That is why after I had read and reread the description of these marvelous objects, I had to do what was necessary to get them, planning wisdom be damned. Your happiest moments in collecting will be those that deliver a new level of excitement. “You can’t escape she’s in your memory. So I took the plunge and acquired this item for The Lant Collection. People ask me will I use this item… will I use any of the many silver serving dishes I’ve acquired? The answer is always a resounding “I do.” And if you think that your salad tastes the same in wood as it does in sterling silver, you need to adjust your palette… for it is impossible to live with and use a beautiful object without yourself being uplifted by the experience. This is the importance of my collection… and when you see it, you are not just experiencing the item or how it looks, but what it can do to improve your life. This lovely three-part set proves this again, for it is never just an implement, it is a way to deliver perfection… and that must always be the overriding goal. N.B. I take this opportunity to thank Michael Johnson of Eiseman’s Jewels in Dallas, Texas. One of the great things about collecting is the tremendous people you meet along the way, people who know more than you do and are happy to share it. Michael Johnson is such a person. He generously made time to discuss these lovely items and provide me with photographs. Of course he wanted to make the sale; and he did. But more importantly, we both made a new friend and a new source of valuable information. Thank you, Michael. Hey, Internet marketing chump. Looks like you’ve been fooled again. You must like it! Author’s program note. I can’t stand it another minute, Poopsie. I just cannot stand by and let you fail for even one more minute. Because today, like yesterday, and all the days before, you are going to fail; you are not going to make a single penny from that joke you call your online “business”. Instead by day’s end when you’ve racked up another day of chump change, you’ll be worse off… a day wasted, a precious day you could have used to get ahead, now in the cosmic trash can… clueless on how to get out and make the money you say you want. Look at yourself closely in the mirror right now… that’s one poor puppy staring back at you…. pale, wan, hapless, helpless, pathetic, disgusting. And this is the guy you expect to lead the victory parade? LOL! LOL! LOL! It’s time for your Internet marketing make-over… It’s time to own up to and grasp what you are doing (the stuff that doesn’t work) and what you must do (if you expect to have any chance of online success at all). Let’s get started with a cool tune that pretty well summarizes the mess you’re in, the mess you’ll stay in if you don’t follow sensible advice and make a radical change. Go to any search engine now. Find the tune and set it on the highest decibels, for you’re about to fly. Put up your collar… find those ultra cool shades you sheepishly wore just once… wear them like the symbol of insolence and impertinence they were meant to be … now move that arthritic body… for babeeeeee, you are about to astonish the world; Tom Petty and his Heartbreakers — plus one extra guy looking remarkably like… me — are about to help you out of the sad situation you just can’t seem to shake . The song is “Fooled Again (I Don’t Like It”). Recorded in (1971, it was what rock was all about… attitude… edge… in your face… don’t tread on me, maggot… stand back world and prepare to be astonished, I’ve got the ticket to ride. Now hear this… you’re not just singing a tune… you’re announcing the advent of the new regime… the regime where you’re a successful online marketer, not just some luckless schlepper, kick-me sign always on your back side, the guy it’s oh-so-easy to ridicule, disdain, and dismiss. You can always feel sorry for these toads, but you can never, ever respect them. And that’s why you don’t just need to scream “I don’t like it”. You’ve got to do something to turn the fiasco you call Internet marketing around… and at once! Try these suggestions on for size. 1) STOP doing what you’re doing. It doesn’t work. Can’t work. And the silliest thing is that you ever thought it would work. The great thing about the ‘net is how easily you can test your ideas, thoughts and suppositions to see how well they work, indeed to see whether they work at all. For you see, something that doesn’t work today is not going to work tomorrow. Thus, experimentation is and must always be the order of the day, every day. If you won’t test, you won’t succeed. 2) Get trained. In my role as an Internet success counselor at Worldprofit Inc, have had occasion to train, work with, and nudge thousands of people worldwide over the last 20 years. Nudge? What that means is not just setting the objective and teaching folks how to achieve it… but to keep each student’s nose to the grindstone, keeping them focused, accepting absolutely no excuses, including absolutely no “special pleading” where the candidate offers “reasons” why she didn’t do what she was pledged to do: following each and every step, no ifs, ands, or buts. Your nudge is an essential part of your success team, and though I say it myself, I am the best nudge on Earth, the least easy to deceive and hide from, unrelenting, never losing sight of the goal, more determined to see you successful than absolutely anyone except your mother. You’d be exceptionally lucky to work with me, and that’s a fact. So, I ask you. Who’s helping you set goals, brainstorm means of reaching them, reviewing results to see what worked and what didn’t, and always ensuring you stay on track? Yeah, I thought so. You’re not doing it, no one is helping you do it. You’re not focused on results, no one is helping you get focused. Thus your results are non existent, just the way they have always been. What an embarrassment! Have you got any self-respect? 3) You have no list and are not doing the consistent, strenuous work it takes to grow one. This one’s a real killer. The correct answer, of course, is your list. It is essential, irreplaceable, unique. It’s loss would be catastrophic, a body blow from which you might never recover. And that is why “the list is the business, the business is the list.” The $64,000 question just this: What did you do today to build your list and turn it into the huge money-making tool you require to make the big bucks you say you want and haven’t got a clue how to get. Self-deception, self-deceit, self-delusion. This is what you’re specializing in and your thread-bare results give ample testament about just how successful you’ve been… and will always be. That better make you happy, because that, lamb chop, is what you’re going to get. 4) How are your copywriting skills? Can you write the words that dance and thrill, the words that make people from Alabama to Beijing jump up and shout, causing even the deadest heart to beat faster, faster, faster still? You’d better be, because otherwise you’re in for a lifetime of significance expense, since top copywriters command top dollars… the dollars that come straight out of your pocket; so sad for you but absolutely necessary if you expect to have ad copy that pulls the more lucrative response. Of course knowing you, you’ll try to conjure the magic words yourself; anything to save a penny. But that, as you’ll quickly learn, just won’t cut it… words without the wizard’s legerdemain, without the magic, produce dismal results… and that just won’t do unless you like endless outflow and driblets of income, few and far between. This is your certain fate when you turn down demonstrated experts and attempt to do their crucial job yourself. Sucker. 5) Trying to build a money-making business off of “free”? Are you one of the hundreds of millions of would-be entrepreneurs online this very moment who is making — and every single day, too — the critical, fatal error of trying to make money off “free stuff” to be found online? If so, listen up. That is IMPOSSIBLE, can’t be done, and only wastes your time and energy. Did you hear me? The extent to which you want Internet success without reasonable investment is the extent to which you will fail, absolutely, positively, guaranteed. Now for the real craziness. Day after futile day would-be entrepreneurs and Internet marketers enter the Live Business Center at Worldprofit.com. They are told, clearly, honestly, politely, thoroughly what they need for success… and go right out to do the EXACT reverse, ensuring failure, DOA. The Internet has empowered these sad creatures, each a candidate for spam, rip-off, certain loss and every variety of bamboozlement. Why does this happen to so many so often with such miserable results? Because the typical ‘net entrepreneur is the very model of sloth, laziness, avarice. They want wealth without effort; magnificent results without knowing how to get them; falling victim over and over again to those who find victimizing these foolish people a piece of cake; integrity, honesty and old fashioned business standards and acumen the first to perish in such a pernicious environment; once gone, gone forever. Must it be this way? Certainly not. Failure as much as success is a choice. Now it’s time for you to make the right decision at last. Visit me in the Live Business Center at worldprofit.com where we work together in a giant worldwide team so that you have expert assistance 24/7/365 advising, counseling, guiding, reassuring, all accomplished in an environment of professionalism and good fellowship. This is the proven way to substantial financial wealth, a unique place online for people who have not hitherto seen such benefits, much less so fast or certain. It’s good, isn’t it, to “see you think so much of me”? What’s more, unlike Tom Petty and the Heartbreakers, you’ll never be fooled again, and you’ll surely like that! What followed sounds straight out of Hollywood, but Rand was straight out of Hollywood, having worked for Cecil B. DeMille. Rand convened a meeting with Nathaniel, his wife Barbara (also a Collective member), and Rand’s own husband Frank. To Branden’s astonishment, Rand convinced both spouses that a time-structured affair—she and Branden were to have one afternoon and one evening a week together—was “reasonable.” Within the Collective, Rand is purported to have never lost an argument. On his trysts at Rand’s New York City apartment, Branden would sometimes shake hands with Frank before he exited. Later, all discovered that Rand’s sweet but passive husband would leave for a bar, where he began his self-destructive affair with alcohol. Rand said, “Capitalism and altruism are incompatible….The choice is clear-cut: either a new morality of rational self-interest, with its consequences of freedom, justice, progress and man’s happiness on earth—or the primordial morality of altruism, with its consequences of slavery, brute force, stagnant terror and sacrificial furnaces.” For many young people, hearing that it is “moral” to care only about oneself can be intoxicating, and some get addicted to this idea for life. Epistemology—reason. Rand’s kind of reason was a “cool-tool” to control the universe. Rand demonized Plato, and her youthful Collective members were taught to despise him. If Rand really believed that the Socratic Method described by Plato of discovering accurate definitions and clear thinking did not qualify as “reason,” why then did she regularly attempt it with her Collective? Also oddly, while Rand mocked dark moods and despair, her “reasoning” directed that Collective members should admire Dostoyevsky, whose novels are filled with dark moods and despair. A demagogue, in addition to hypnotic glibness, must also be intellectually inconsistent, sometimes boldly so. This eliminates challenges to authority by weeding out clear-thinking young people from the flock. Ethics—self-interest. For Rand, all altruists were manipulators. What could be more seductive to kids who discerned the motives of martyr parents, Christian missionaries and U.S. foreign aiders? Her champions, Nathaniel Branden still among them, feel that Rand’s view of “self-interest” has been horribly misrepresented. For them, self-interest is her hero architect Howard Roark turning down a commission because he couldn’t do it exactly his way. Some of Rand’s novel heroes did have integrity, however, for Rand there is no struggle to discover the distinction between true integrity and childish vanity. Rand’s integrity was her vanity, and it consisted of getting as much money and control as possible, copulating with whomever she wanted regardless of who would get hurt, and her always being right. To equate one’s selfishness, vanity, and egotism with one’s integrity liberates young people from the struggle to distinguish integrity from selfishness, vanity, and egotism. Politics—capitalism. While Rand often disparaged Soviet totalitarian collectivism, she had little to say about corporate totalitarian collectivism, as she conveniently neglected the reality that giant U.S. corporations, like the Soviet Union, do not exactly celebrate individualism, freedom, or courage. Rand was clever and hypocritical enough to know that you don’t get rich in the United States talking about compliance and conformity within corporate America. Rather, Rand gave lectures titled: “America’s Persecuted Minority: Big Business.” So, young careerist corporatists could embrace Rand’s self-styled “radical capitalism” and feel radical — radical without risk. While Harriet Beecher Stowe shamed Americans about the United States’ dehumanization of African Americans and slavery, Ayn Rand removed Americans’ guilt for being selfish and uncaring about anyone except themselves. Not only did Rand make it “moral” for the wealthy not to pay their fair share of taxes, she “liberated” millions of other Americans from caring about the suffering of others, even the suffering of their own children. The good news is that I’ve seen ex-Rand fans grasp the damage that Rand’s philosophy has done to their lives and to then exorcize it from their psyche. Can the United States as a nation do the same thing? F R E E consultation ($150 value). Expert shows you how to make money online.Call (757-647-2886) 24/7 Skype me homeprofitcoach NOW! Profit today!”free EBook on list building prior to contacting me!.